Place the broccoli and couscous in a large pan and pour over 200ml of boiling water. Bring to the boil, cover and simmer for 2 minutes then turn off the heat and leave to rest. Preheat the grill to high. Brush the cheese slices with a little oil and grill for 1–2 minutes on each side until golden brown. Stir the red onion, pine nuts, lime juice, remaining oil and the mint leaves into the couscous. 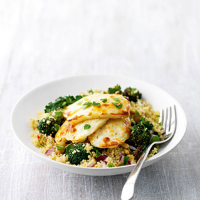 Divide between 2 plates, top with the grilled halloumi slices and serve warm.